And just to add some sugar to it, may be you wanted to customize and decorate the appearance of the input view? Seems pretty cool yeah! That’s what I’m gonna share today! Now there’s no way you could do either of those things in that scenario right out of Xamarin.Forms! Nope, not with a Modal Popup, which doesn’t support transparency, and not even with DisplayAlerts or ActionSheets, since the’re not customizable, they don’t allow text input or any kind of custom input view, only multiple button selections. So how could I do it? So the trick here for adding custom input views to the popup page, is by creating our Xamarin.Forms custom views using a ContentView and set them to the Content of popup page. Alright then time for some coding! Then install Rg.Plugins.Popup library for Xamarin.Forms through Nuget Package manager. Once you’re done with that, let’s create our custom Transparent Popup Page using the Rg.Plugins.Popup we just installed. Popup page provides us with many cool features, including Page background click handling and back button press handling, which we will override as of disable page background click to dismissal and disable back button press cancellation. Pass in a View and set it to the PopupPage’s Content property, which we will attach the custom input view we want to use in our popup page. Set the transparency level to 0.4 of alpha value. There you go, over to the next step! Note that how we are initializing the TaskCompletionSource in the Constructor. 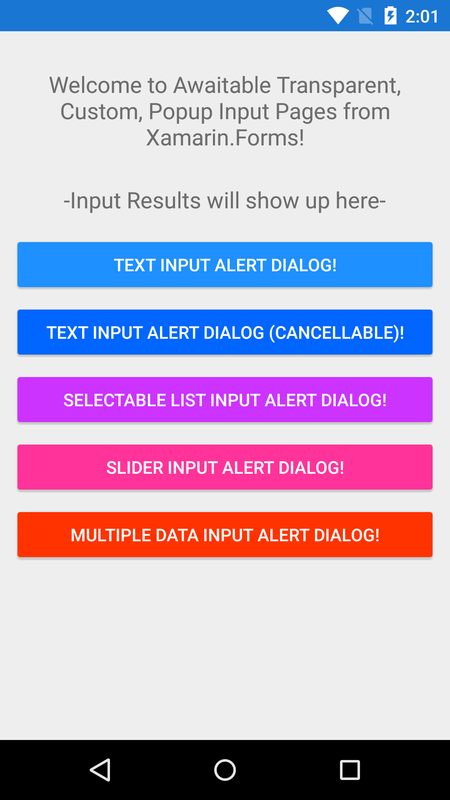 Alright this step is totally up to your desires, you could construct any kind of a Custom Input View to be displayed on top of the InputAlertDialogBase we just created above, and retrieve the User’s inputs. So for this example, let’s create a simple View with Title Label, Text Entry and Ok button yeah! 😉 Also let’s add a simple validation Label inside it to show up if the User tries to leave the Text Entry empty and hit the ok button to quit. Text="You can't leave this field empty!" Pretty simple yeah, next let’s handle the back end of this custom View to manage the Textual values, Ok button’s click event and validations. Now this is important, if you consider a ContentView, all it’s Child elements are private to it’s class scope, so we can’t observe or interact with any of the property value changes or behaviors from outside of the View. Therefore we need to create custom properties that will expose those required values and events to the public. In order to customize the values displayed in the Child elements of the ContentView (Label,Button, etc..) we should pass in the values to the Constructor and set them to the Child elements there. We should create a public EventHandler to handle the Ok Button’s click event from outside the View and add a public string Propery to expose the text Entry’s value to the public. Subscribe to the Entry’s TextChanged event to reflect the value the public string property. Create a public bindable Boolean property to display or hide Validation label in the ContentView. Or you could handle this internally in the View on the Ok Button’s click event as well, but it would be nice if we could expose the Validations to public so we could handle it outside the View. So you can see we are passing in all the required values to set to our Child element’s we are passing in to the Constructor and setting them up there. Also we are subscribing to the Ok Button’s OnClick event and text Entry’s TextChanged event. Inside the CloseButton_Clicked() event we are invoking the public EventHandler CloseButtonEventHandler if it’s being subscribed to by outside. As well as the Entry’s InputEntry_TextChanged() event we are updating the public TextInputResult to reflect the Entry’s text value to the public. Oh and here’s the Bindable Boolean property you should include inside the TextInputView code behind to handle the Validations from outside the View. Following this method, you can create any kind of custom Input Views to be attached to our Transparent Popup Page. 🙂 All you need to do is expose the required Values and Events to the public. Time to assemble everything and consume it! Create an InputAlertDialogBase<string>(), yes of type string, since we are going to return a string from the Popup Alert. Subscribe to the CloseButtonEventHandler of TextInputView’s instance to handle validation and reflect the Text input value to the TaskCompletionSource. Upon result retrieval Pop the page from Stack and return the user inserted value. Well fellas, that’s it for now! Its really cool, Thanks for the post. Saved my time.